Turkish President Recep Tayyip Erdogan angered the Greek government Sunday when he suggested converting the Hagia Sophia, a cathedral turned museum, into a mosque. “It’s not impossible … but we would not do it under the name ‘museum’ but ‘Hagia Sophia mosque,'” Erdogan said according to AFP. “Tourists come and go at the Blue Mosque. Do they pay anything? … Well, we will do the same with the Hagia Sofia,” he added. The Greek government railed against the idea, arguing that the 6th century cathedral was once the seat of eastern Christendom and has been recognized by UNESCO as a world heritage site. “We want to hope that the correct statements of March 16 by the Turkish leadership will be valid and there will be no change of this status,” he added. The Hagia Sophia was first commissioned by Byzantine Emperor Constantius in 360 A.D. The basilica was destroyed and rebuilt twice over the years as a result of riots. Emperor Justinian I ordered the construction of the third and final iteration of the basilica built in 532 A.D. Construction finished five years later. The structure remained a Christian basilica until 1453, when the Ottomans conquered the city (then Constantinople) and converted the Hagia Sophia into a mosque. The Ottomans covered much of the Christian iconography inside with Islamic calligraphy and used the Hagia Sophia as a place of Islamic worship until Mustafa Kemal Ataturk had it converted into a museum in 1935, nine years after founding the Republic of Turkey. 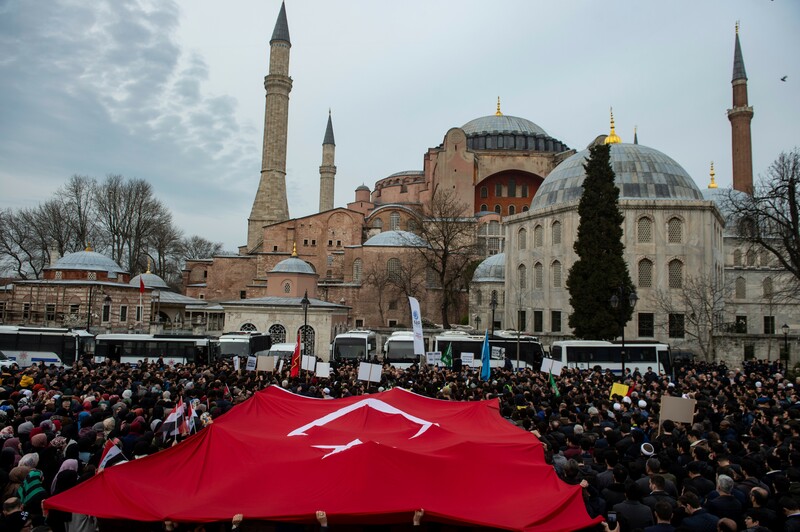 Proponents of the form of secularism that Ataturk established in Turkey have openly criticized Erdogan and his party, partly out of concern that Erdogan supports conservative Islam over secularism and has planned to convert the Hagia Sophia to a mosque for some time.